The home of potter Iskandar Jalil is filled with art, including works by his students, such as this sculpture (above) by Hiroko Mita, consisting of twin crescent shapes joined by a chain of clay shapes, and a bottle by Agnes Lim. The home of potter Iskandar Jalil is filled with art, including works by his students, such as this sculpture by Hiroko Mita, consisting of twin crescent shapes joined by a chain of clay shapes, and a bottle (above) by Agnes Lim. Nearly every corner of Iskandar Jalil's terraced house in Kembangan is filled with some sort of art, running the gamut from ceramic works by the 78-year-old master potter himself to pieces by acclaimed British potter Bernard Leach and Iskandar's students Aida Khalid and Agnes Lim. In a way, these artworks are artefacts, objects that bear the messy traces of personal memories. "When I collect (art), I want to know the person. I need to see how he feels," says the Cultural Medallion recipient who is married to a retired teacher. They have two children. In his home, he has three porcelain bowls by the late New Zealand architect and potter David Brokenshire, which skilfully capture the motion of waves. "He had one of the most unique kilns in the world," says Iskandar, recalling his visit to Brokenshire's home in Christchurch. "(His work) was made from porcelain clay... You had to fire it to 1,310 deg C for two days and one night." Iskandar, who also has paintings and collects basketry and metal beetle nut cutters on his travels, recalls one trip to Lombok, Indonesia, when he bought an earthenware pan from a woman in a village who was using it to fry coffee beans. "I said, 'I don't want a new one. I want the old one.' They thought that 'this man must be mad'," says Iskandar, who, in 1972, studied ceramics in Japan under a Colombo Plan scholarship. Even the most unobtrusive thing in his house might be construed as art. The living room table was a gift from the former governor of Japan's Miyazaki Prefecture, who crafted it himself from cedar wood more than four decades ago. A sculpture by Iskandar's student, Hiroko Mita, consisting of twin crescent shapes yoked to each other by a 1.4m-long chain of linked clay shapes, was inspired by the relationship between Iskandar and his wife. Iskandar does not collect works by his mentors because "the prices are astronomical". He would like to own some works by potters Hans Coper, Shoji Hamada and Lucie Rie, but says he cannot afford them. A small bowl by Rie recently sold for half a million pounds (S$881,000), he says. He was diagnosed with prostate cancer in 2014, but remains active and has continued to present solo exhibitions. His latest, Paradox, runs at the Japan Creative Centre till Friday. Several cupboards in his house are filled with ceramic works which he euphemistically describes as "teaching aids". One of them is a round piece by a former student who smoothened the surface with a bamboo stick. "I kicked her out," says Iskandar, whose art often has an organic style. "It was too perfect." Step into the Housing Board flat of Singapore's most famous watercolourist Ong Kim Seng, and a painting depicting a leafy road up to Cameron Highlands will be one of the first things you see. This is a work by second-generation Singaporean artist Wan Soon Kam, an artist whom 73-year-old Ong admires. Wan, a prolific watercolour and acrylic painter, is known for his scenes of rustic kampungs, old buildings and city landmarks. "He has his own way of doing leaves, plants and trees, a very special technique," says Ong of his friend, who is two years his senior. "I don't think there is anyone else who paints the way Wan Soon Kam paints." 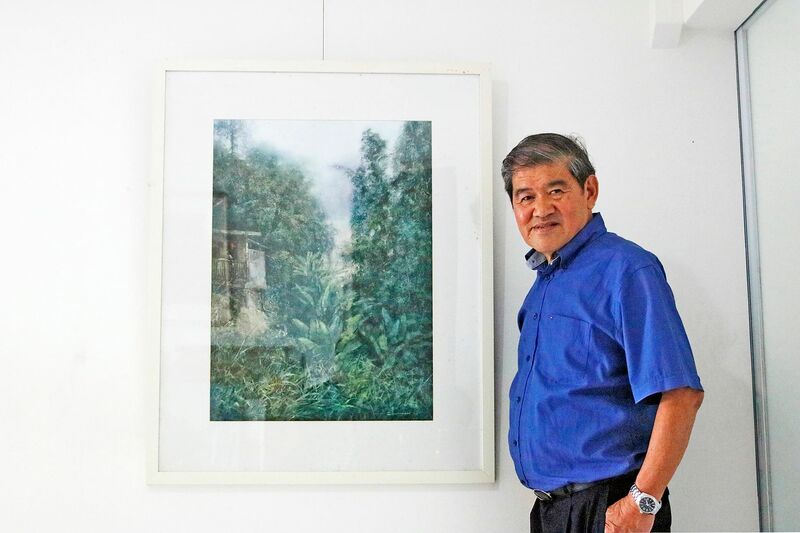 Ong, a Cultural Medallion recipient, has about 100 watercolour and oil paintings by Singaporean and foreign artists in his five-room HDB flat in Hougang. "Artists need support and the biggest support comes from (artists) themselves. There's nothing like buying to give encouragement," says Ong, who often buys works at exhibitions. Works by local artists Tan Ai Ngin, Chen Chong Swee, Chong Ah Tong and Marvin Chew are among those in his collection. But money is a limiting factor, he says. The artist, who tends to spend less than $10,000 on each painting, once set aside $35,000 for a Willem Hofker painting at an auction. Sadly, this was no match for the winning bid of $60,000. Ong, a father of three, says the works he hangs in his living room are "serene and peaceful" to offer some reprieve from the stresses of daily life. Each work is also technically brilliant in its own way. "We can't just say, 'My work is the best,'" he says. "There are artists who are good at what they do and we have to admit it. I know where I stand." He points to two paintings of ballerinas by Liu Yi. The Chinese artist is known for his mastery of "wet-on-wet" technique, where one colour is laid over another before the first layer has dried. Ong, who paints mainly landscapes and street scenes, bought Liu's dreamy ballet dancer paintings Preparing (2007) and At Rest (undated) when he was in Shanghai. It is "very difficult" to paint human figures in watercolour, he says. "If you asked me to produce something like that, I wouldn't be able to." He rummages through his collection and pulls out a painting of Singapore by Dong Kingman, one of the pioneers of the California style of watercolour painting. This was a particularly hard-won piece, he notes, but not because of how much it cost. "Finally, after I won quite a number of awards from the American Watercolor Society, he gave me this painting," he recalls. You might not recognise the artist's name, but you will probably know of the Local Mynas, a trio of painted bronze sculptures that once perched in front of the Victoria Theatre and Concert Hall. Home-grown sculptor Lim Soo Ngee, 56, who teaches at the Nanyang Academy of Fine Arts (Nafa), is known for his whimsical spirit, as seen in the myna sculptures, and has a home to match it. 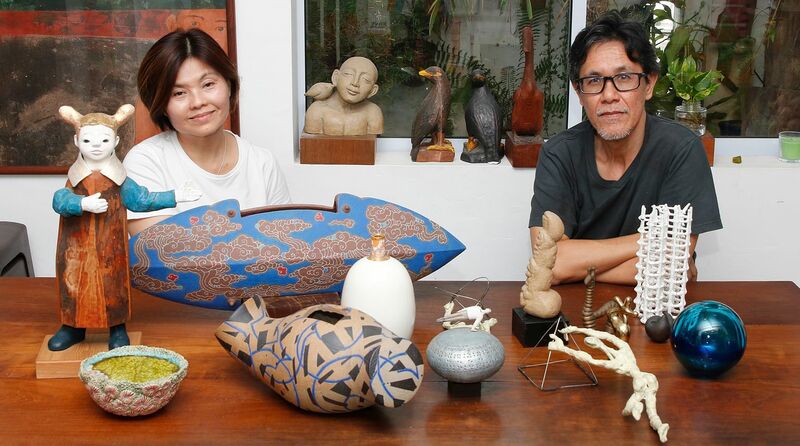 His terraced house in Hougang, which he shares with his wife April Ng, a printmaker, is an eclectic jumble of works by artists such as the acclaimed sculptor Han Sai Por, Malaysia-born potter Peter Low, emerging ceramicist Nelson Lim and visually impaired printmaker and sculptor Chng Seok Tin. The pieces range from artsy metallic flowerpots and a glow-in-the-dark human figure in a state of struggle, to bronze sculptures their friend Han gave them years ago as a gift for their now-adult son, their only child. "Some people who don't know us think we sell antiques ," says Ng, 55, who also collects prints and paintings. One cheeky sculpture is a ceramic finger by the late pioneer artist Ng Eng Teng. Lim, who is convinced that it must be a middle finger, bought it at an exhibition for about $750. Another quirky piece is by Japanese artist Toshimatsu Kuremoto, featuring a wooden squashedbaseball structure coated with aluminium, with an epoxy figurine balancing on top. They bought it for about $1,300 at a contemporary art fair in Singapore two years ago. "I create human figures too," says Lim. "And when you see someone working well with the medium or having a good composition, you appreciate his craft. "Actually, it's very simple... We know these people. Sometimes we support each other... If (the work) is fun, we like it and the price is reasonable, we will buy it." 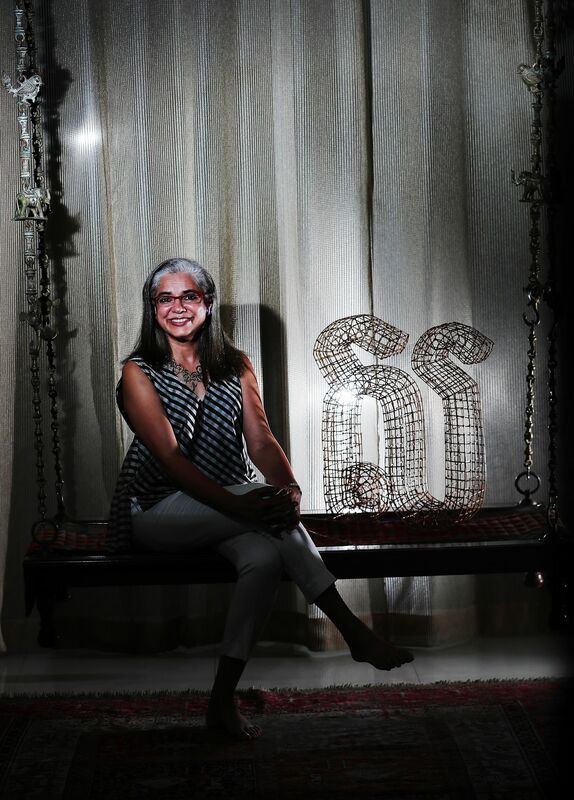 Ceramics artist Madhvi Subrahmanian may have a fine selection of sculptures, paintings, and antique furniture in the living room of her condominium near Bukit Timah, but she will be the first to say that she is not much of a "collector". "I'm not interested in so-called blue-chip artists," says the full-time artist and curator, who is in her early 50s. "I only buy things I know I want to live with. Each one is connected to a memory." Mumbai-born Madhvi is known for her organic, earthy ceramic works that break the mould - from latticed structures inspired by the shape of her pregnant womb to large scale obelisk-like "seedpods". She has had solo exhibitions in Singapore, India and the United States and helped curate India's first Ceramics Triennale this year. Some of the works by other artists that she owns are, quite literally, priceless. She acquired a number of them by swopping her own pieces for them. A prized artefact from one such barter trade is an airy rattan sculpture by Cambodian artist Sopheap Pich, fashioned in the shape of the letter "S" in the Khmer alphabet. Pich's works, which often feature rattan and bamboo, have been exhibited at the New York's Metropolitan Museum of Art and Singapore's National Gallery, among other locations. Madhvi is a big admirer of Pich's work. He gave the work to her and picked her sculpture, a 15-inch porcelain work called Tree Of Life, in exchange. Aside from Pich's sculpture, which she displays on a side table, she has several works by well-known Indian artists. One of them is a paper on canvas piece by the late Indian abstractionist Mehlli Gobhai - called the Mark Rothko of Mumbai. "It's almost like a skin," says Madhvi, admiring the layered surface. She adds that it took five years to persuade the artist to sell it to her. In the corner of her living room is a photo-montage of HungarianIndian painter Amrita Sher-Gil. Created by the late artist's nephew Vivan Sundaram in 2001, it comprises a 1920s self-portrait juxtaposed against a photo of her taken around the same time . All these works, Madhvi says, influence her practice "by osmosis". "(The art) comes into your subconscious. It grows on you." Multidisciplinary artist Sarah Choo Jing, 28, a rising star in Singapore's arts scene, comes up with ideas for her projects in interior spaces ranging from her bedroom to hotel rooms in Geylang and Katong. "Whatever's around me will translate to my artwork," says Choo, who is known for her immersive installations and fine art photography. 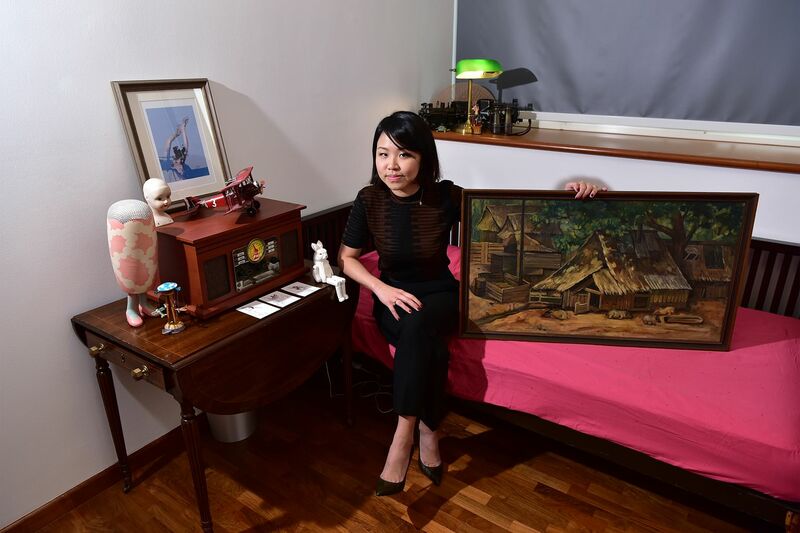 The brainstorming for her multimedia installation, The Hidden Dimension II (2013), which probes the themes of family, people and relationships, happened in her bedroom in her parents' home, a condominium near Hougang MRT station. This room ("my stage, my backstage") contains a mix of vintage and contemporary art works that she has collected, including several by Singapore female artists. Among them are a pink, plump and high-heeled ceramic figurine from Xin Xiaochang's Please Lah! Singapore (2012) series and a digital print by Zu Orzu, featuring a female swimmer with a face composed of splash-like splotches. "I am very drawn to works I know I cannot do, " says Choo, who teaches art at Nanyang Girls' High School. The prints by Zu, a friend from her undergraduate days in Nanyang Technological University's School of Art, Design and Media, have an "amazing" use of negative space. "Xiaochang's works have tongue-in-cheek humour and the colours are brighter. My works, on the other hand, are very dark." During work trips, she buys trinkets such as a vintagetin train in London, a porcelain doll in Paris and a mask during last year's Venice Biennale. She is fascinated by marionettes and suggests that the work she does has parallels to that of a puppetmaster. "I manipulate documented images... I manipulate people I see on the street and present them in a specific time and place without them being aware of it." Midway through the interview, she stumbles on an oil painting of pigs in a pigsty. It was painted in the 1950s by her late paternal grandfather, who worked as a driver. "My very first memory was of me looking up at this painting on the wall. I would eat dinner and this is something that I would stare at. "I wondered, why pigs? Is it because I am Sarah Choo? I could never understand it. Why not put up paintings of mountains, scenery... Why a pigsty?" The surname Choo is "zhu" in Chinese, which sounds like the Chinese word for "pig". Choo, who is the only other artist in her family, also keeps some old hand-tinted photos by her grandfather in her room. "He was doing photography during that era when it was all black and white, and they used watercolour to tint it. I remembered looking at them and thinking, 'Why can't I do it now?' And that's when I started painting on my photographs." Her grandfather was a jack of many trades or, as Choo quips, "multidisciplinary". The bitter cold adds fragrance to the plum blossom.An intimate friend is hard to come by. Never cease from exploring famous mountains. 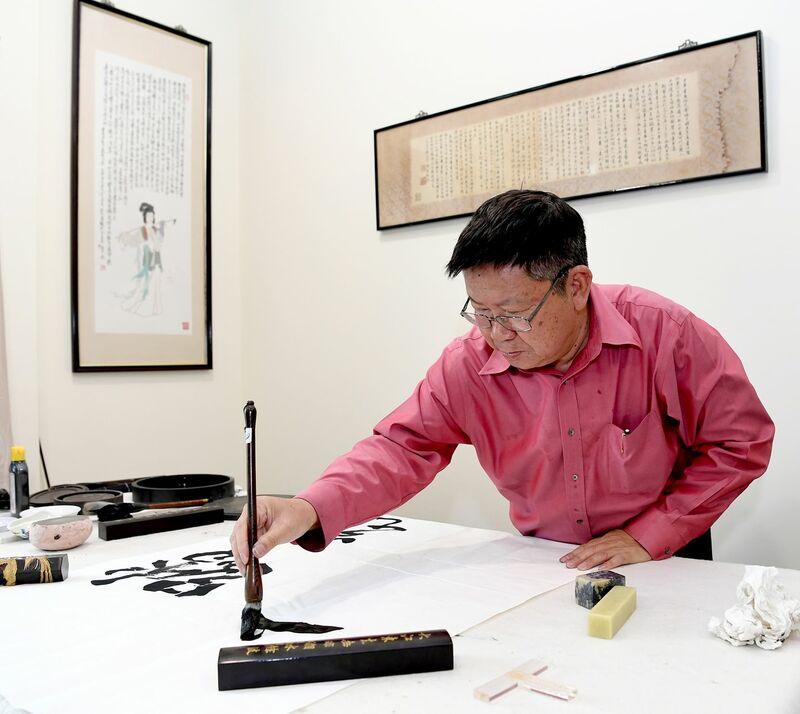 These are the poetic sayings carved from the "xian zhang", or "unofficial seals", that Chinese calligrapher Tan Siah Kwee, 70, has in his study at his terrace house in Katong. After he finishes a piece of calligraphy, he sometimes stamps it with one of these seals, which were carved from stone by craftsmen in China about three decades ago. He choses the seal according to the mood he wants to convey. Call them the literary equivalent of modern-day emojis, if you will. "When these sayings are sophisticated, they make people pay attention to the work," he tells The Straits Times in Mandarin. Tan, who was born in Guangdong, China, moved to Singapore in the 1950s. In 1968, he founded the Chinese Calligraphy Society of Singapore and is now its president. The Cultural Medallion recipient has a collection of more than 3,000 works of calligraphy at his home, but displays only a handful, keeping the rest wrapped in newspapers. He is married to a retired teacher and they have two daughters. He hangs his friends' calligraphy works on the walls of his house. These range from a 1980s painting of a green bamboo by Qigong - a renowned calligrapher descended from Qing emperor Yongzheng-to a vivid piece by Ma Quanyi, depicting two galloping horses. One piece on the wall of his study is Hong Shichuan's painting of Lin Daiyu - the beautiful, unhappy woman from the Chinese classical novel Dream Of The Red Chamber - burying fallen petals at a hillside. In this famous scene, Daiyu, overcome with melancholy after a misunderstanding with her beloved, wonders: "But who will bury me when I leave the world?" Tan, describing Daiyu - gentle, narrow-waisted - as a model of Chinese femininity, says of the work which was given to him in 1983: "The tricky thing is that the written words go on for so long - they are bigger than the painting - but you don't feel they weigh it down. People don't write in such fine script anymore... The lines here are not too thick, so they don't overshadow the painting below." The adjacent wall features another piece of calligraphic script - a kind of foreword for a 1971 exhibition by his first calligraphy teacher when he was a student at Chung Cheng High School, the late Tan Keng Cheow. "It suggests that calligraphy is a traditional art and you need to remember the importance of developing a good foundation," says Tan. "At the beginning, we should imitate others and learn from them. Everything we do bears traces of someone else."